Here's a ghoulish grammar sheet to help your child practice identifying adjectives! She'll need to find the adjectives in each sentence. This activity will build her vocabulary and get her into the Halloween spirit. Practice parts of speech the fun way, with some Halloween nouns. Students must find and underline all the nouns in these spooky sentences. Students practice sequencing story events with this worksheet. Cut out the sentences into strips and then build your story by arranging them in the best order. 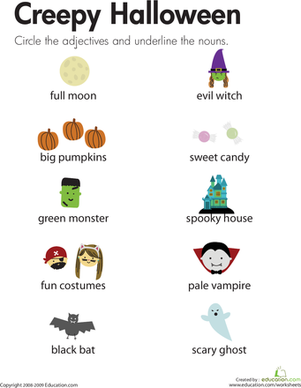 Build vocabulary with a ghostly grammar sheet, featuring Halloween adjectives! Your child will choose the right adjective to go with each sentence. Get ghoulish with grammar this Halloween, and learn how to use adjectives to make your sentences more spooky! Add some great adjectives! Get some practice with this Halloween grammar sheet. Get into the spirit of Halloween with a ghoulish grammar worksheet! Your child will help make these spooky sentences even more scary by adding adjectives. Kids can pick a room or go outdoors to identify as many adjectives as they can. Write down each noun the adjective is describing, and circle the adjective. By adding some spooky adjectives! Get some practice adding adjectives to these sentences. Get into grammar in a ghoulish way this Halloween, with a spooky adjectives worksheet! Your child will add adjectives to these sentences. Ghostly grammar students, practice identifying adjectives with this spooky sheet! Your child will circle the adjective in each sentence. Hone your haunting writing skills this Halloween with a ghostly grammar sheet! This will help your child practice adding adjectives to sentences.